At Strong Life, we always recommend being extremely aware and careful if you decide to undertake your own DIY metal roof restoration Melbourne. We do this for a number of reasons, one of which is there are many risks most people aren’t aw are of. If you are new to doing roof repairs, then you need to read both our DYI Danger With Fixing Downpipes and Guttering and Ladder Use For Dummies blogs. However, if you are contemplating carrying out a DIY metal roof restoration Melbourne, one hazard you might not have anticipated is Asbestos. What most of the general public didn’t understand was that the asbestos related illnesses that the miners suffered were classified as ‘first wave’. The ‘second wave’ of asbestosis illnesses is predicted to happen to people renovating, or removing homes that were build pre-1972 (and sometimes afterwards). A scary fact for anyone considering entering their roof for a DIY metal roof restoration Melbourne. Asbestoswise also reports ‘it was not until 31 December, 2003’ that products containing asbestos were actually banned from being used throughout Australia. So, if you’re planning a DIY metal roof restoration Melbourne on a house built or renovated before 2003, your property could have asbestos used within its construction. roofing • shingles and siding (villaboard and similar) • exterior and interior wall cladding • eaves • fencing • thermal boards around fireplaces • water or flue pipes, and many other areas within your property. So, if you do decide to do your own DIY metal roof restoration Melbourne, and be completely safe, you need to have an asbestos inspection carried out before you even think of disturbing any roofing materials. Asbestoswise recommends contacting ‘the National Association of Testing Authorities (NATA) for an analytical laboratory in your area that is accredited to identify asbestos on 03 9329 1633 or by visiting www.nata.asn.au’ to find out if you do have an asbestos problem or not. 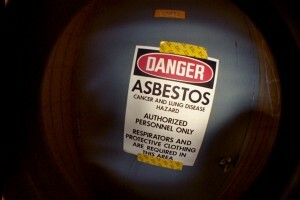 What if your roof does has asbestos? If a testing service does find you have asbestos in your roof, do not, under any circumstances disturb it. Asbestos particles are carried in the air, and are completely safe unless its dust becomes airborne. However, you should know asbestos/cement sheeting can release deadly asbestos fibres if it is worn or degrading. Contact a licensed Asbestos Removalist. There are plenty of them listed online. It can be costly to remove asbestos, but, your life and health, and those of your family could be in danger if the asbestos is disturbed or simply breaks down from normal wear and tear. There isn’t anything that gives you a greater sense of accomplishment than a DIY metal roof restoration Melbourne. However, like we always say, ‘if in any doubt, in any way, shape or form, call in the professionals. Strong Life is a professional company that has been in the roofing and guttering business for over 25 years. All Strong Life Roofing and Guttering jobs carry our unique 3 Stage Warranty, 25 Year Manufacturer’s Warranty on Materials, 6 Year Strong Life Warranty on Workmanship and 100% Satisfaction Guarantee*. We are proud to use only Colorbond and Bluescope Steel roofing and guttering materials. And there’s a seniors discount – just to lighten the load on the mature ages. ** This blogs are general in nature and is ONLY meant to give readers an overview of the subject matter. Do NOT rely on this information for your specific needs. If you need any advice on asbestos or Metal Roof Restorations arrange for professionals to visit your premises to advise on your SPECIFIC requirements.